A double fronted three bedroom detached chalet bungalow. This property is chain free with detached garage and mature gardens. ENTRANCE HALL Obscured glazed panelled door to front aspect. Doors to all ground floor rooms and cupboard. SITTING ROOM 15' 11" x 10' 11" (4.85m x 3.33m) Double glazed windows to both front and side aspect. DINING ROOM 12' 10" x 10' 10" (3.91m x 3.3m) Double glazed windows to the front aspect, stairs to the first floor. 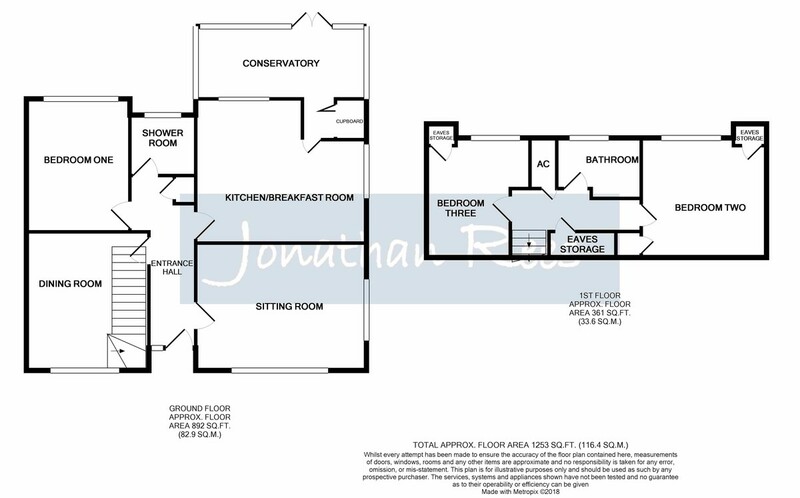 KITCHEN/BREAKFAST ROOM 15' 10" x 11' 9" (4.83m x 3.58m) Dual aspect double glazed windows to side and rear. A range of wall and base level units with space and plumbing for appliances. Boiler. CONSERVATORY 16' 8" x 8' 0" (5.08m x 2.44m) Double glazed windows to rear and side with French doors leading to the rear garden, storage cupboards. MASTER BEDROOM 13' 9" x 9' 8" (4.19m x 2.95m) Double Glazed window to the rear aspect. SHOWER ROOM Obscured double glazed window to the rear aspect, suite comprises of a curved sliding glass cubicle with bar shower mixer, wash hand basin with mixer tap above, low level WC. LANDING Airing cupboard and doors to bedrooms two, three and bathroom, eaves storage. BEDROOM TWO 11' 6" x 10' 10" (3.51m x 3.3m) Double glazed window to the rear aspect, eaves storage. BEDROOM THREE 11' 6" x 7' 5" (3.51m x 2.26m) Double glazed window to the rear aspect, two eaves storage cupboards. BATHROOM Obscured double glazed window to the rear aspect, suite comprising of panelled bath with electric shower over, low level WC, pedestal wash hand basin, tiled to principle areas. GARAGE Up and over door, power and light, eaves storage, dual aspect windows. OUTSIDE The rear has a patio and lawned area with shrub borders surrounded by fencing with gate to side and access through to driveway, car port for multiple off road parking as well as the garage.